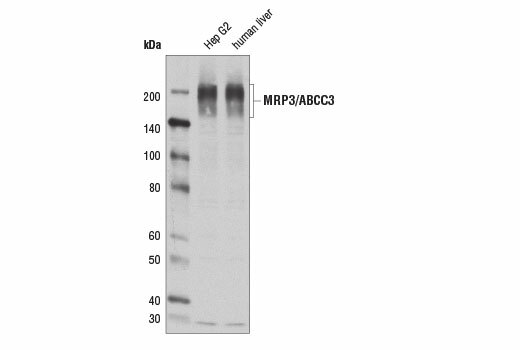 Western blot analysis of extracts from Hep G2 cells and human liver using MRP3/ABCC3 (D1W1P) Rabbit mAb. Immunoprecipitation of MRP3/ABCC3 from Hep G2 cell extracts using Rabbit (DA1E) mAb IgG XP® Isotype Control #3900 (lane 2) or MRP3/ABCC3 (D1W1P) Rabbit mAb (lane 3). Lane 1 is 10% input. 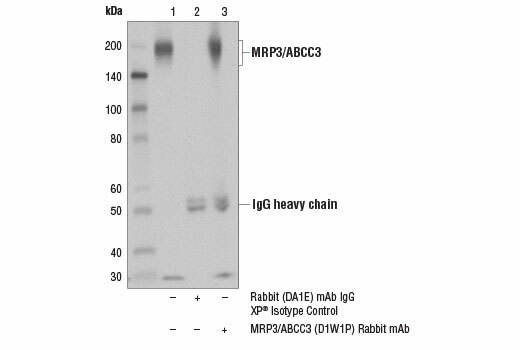 Western blot analysis was performed using MRP3/ABCC3 (D1W1P) Rabbit mAb. Monoclonal antibody is produced by immunizing animals with recombinant protein surrounding Gly870 of human MRP3 protein. MRP3/ABCC3 belongs to the super family of ATP-binding cassette (ABC) transporters. It is a member of the MRP subfamily that is expressed in various organs including liver, gallbladder, small intestine, colon, kidney, and adrenal gland (1-3). MRP3 is involved in multi-drug resistance (1). It facilitates the efflux of organic anions including monoanionic bile acid and anti-cancer reagents such as etoposide and paclitaxel from liver and small intestine into blood (4-7). Expression of MRP3 is increased in the cholestatic human and rat liver, suggesting its role in cholehepatic and enterohepatic bile circulation and in protecting liver from toxic bile salts (2,8). MRP3 expression is also upregulated in people with Dubin-Johnson Syndrome (DJS) who lack functional MRP2 in the liver, which implicates the compensatory role of MRP3 in the absence of functional MRP2 (4). Elevated expression of MRP3 has been detected in various cancer types such as hepatocellular carcinomas, primary ovarian cancer, and adult acute lymphoblastic leukemia (ALL) (9-11). Overexpression of MRP3 was reported to be a prognostic factor in ALL and adult acute myeloid leukemia (AML) (11,12). Uchiumi, T. et al. (1998) Biochem Biophys Res Commun 252, 103-10. Scheffer, G.L. et al. (2002) Lab Invest 82, 193-201. Kiuchi, Y. et al. (1998) FEBS Lett 433, 149-52. König, J. et al. (1999) Hepatology 29, 1156-63. Zelcer, N. et al. (2001) J Biol Chem 276, 46400-7. Belinsky, M.G. et al. (2005) Mol Pharmacol 68, 160-8. Dickerson, W.G. (1992) Dent Today 11, 54-5. Soroka, C.J. et al. (2001) Hepatology 33, 783-91. Nies, A.T. et al. (2001) Int J Cancer 94, 492-9. Ohishi, Y. et al. (2002) Clin Cancer Res 8, 3767-75. Plasschaert, S.L. et al. (2005) Clin Cancer Res 11, 8661-8. Benderra, Z. et al. (2005) Clin Cancer Res 11, 7764-72.